In states like Missouri, last summer’s drought was downright scary. Farmers saw their corn shrivel in the fields, ranchers ran out of feed for their cattle, and commerce on the Mississippi River slowed to a crawl, as barges struggled to avoid newly exposed rocks on the low-flowing river. But this spring brought relief. 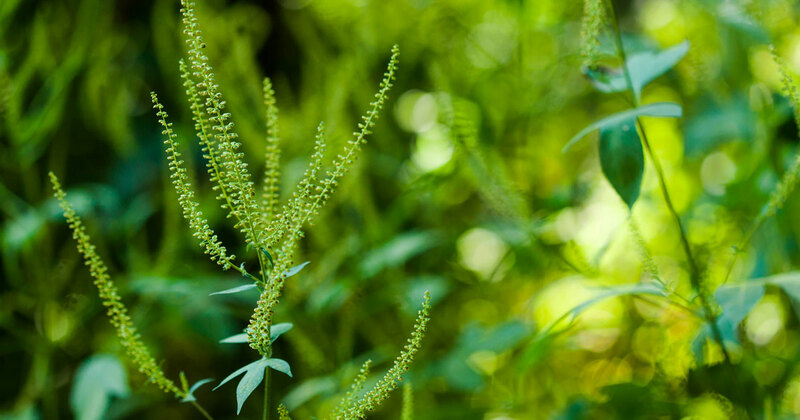 And now, after one of the wettest springs on record, life will return to a different sort of normal for many Midwestern farmers, as they deal with the problem of having too much water. This is what the extent of drought looks like in the U.S. today — with virtually no drought conditions present along and to the east of the Mississippi River. 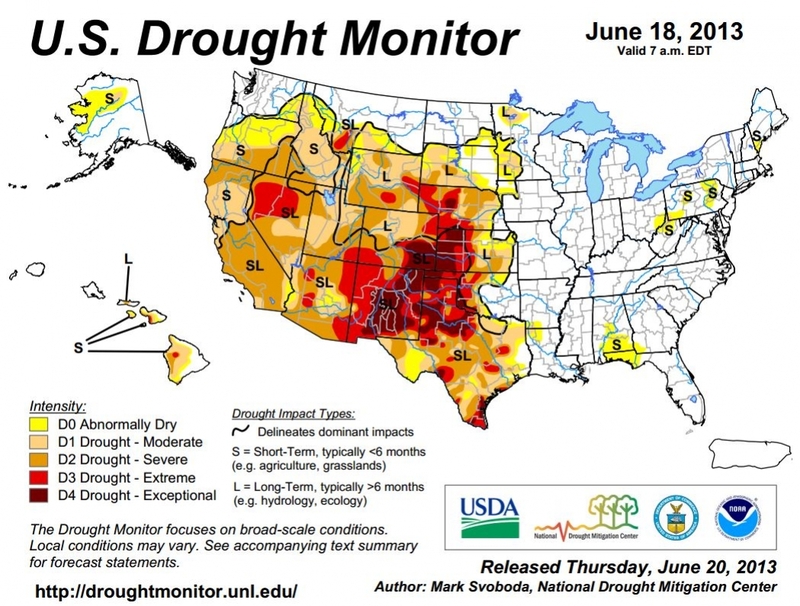 U.S. Drought Monitor June 18, 2013. This comes from the U.S. Drought Monitor, which combines a variety of short-term and long-term impacts (such as measured rainfall, reservoir levels, and vegetation health) to paint a picture of how drought looks across the country. 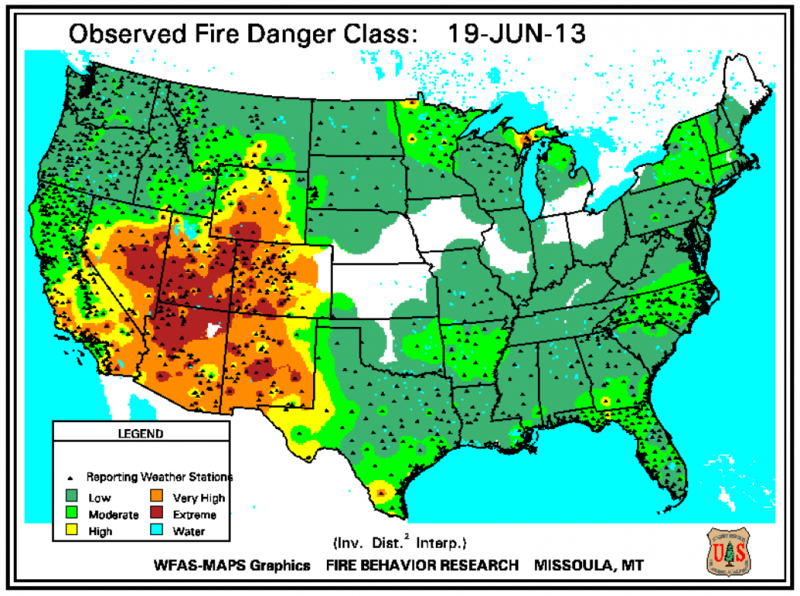 Many of the remnants of the 2012 drought are still in place all across the West. Notice the large area of “Exceptional Drought” (D4) in brown that crosses into six states, and the vast swaths of “Severe” (D2 in red) and “Extreme Drought” (D3 in orange) that stretch across California, Nevada and most of the Rocky Mountain states. In the 10 Western states, 77.50 percent of the land area is now under some form of drought. Short-term impacts are already apparent. According to the USDA, 75 percent of last winter’s wheat crop was rated in poor or very poor condition in Texas. In Arizona, 79 percent of the pastures and rangeland were in poor or very poor condition, which is bad news for the livestock that rely on that grass for grazing throughout the summer. In New Mexico, that number was 93 percent. But it’s the long-term impacts that are reverberating throughout the West. They also take the most time from which to recover. Years of low rainfall and decades of agricultural irrigation and population growth are draining the water resources the Southwest draws from throughout the year. Aquifers and reservoirs shrink a little more with each year of drought, and require more and more rain to replenish them in subsequent years. 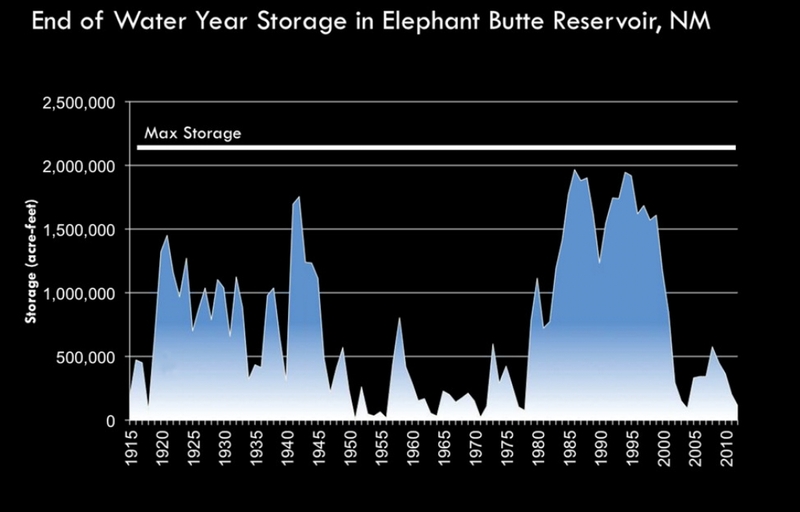 This graph shows historical water levels in the Elephant Butte Reservoir on the Rio Grande in southern New Mexico. Compare that with the graph below, which shows a technical measure of drought (the “standardized precipitation-evapotranspiration index” or SPEI) over that same period. Consecutive wet years, like the years from 1983-1988 allow the reservoir to recover, but a few abnormally dry years can quickly drain the reservoir again. 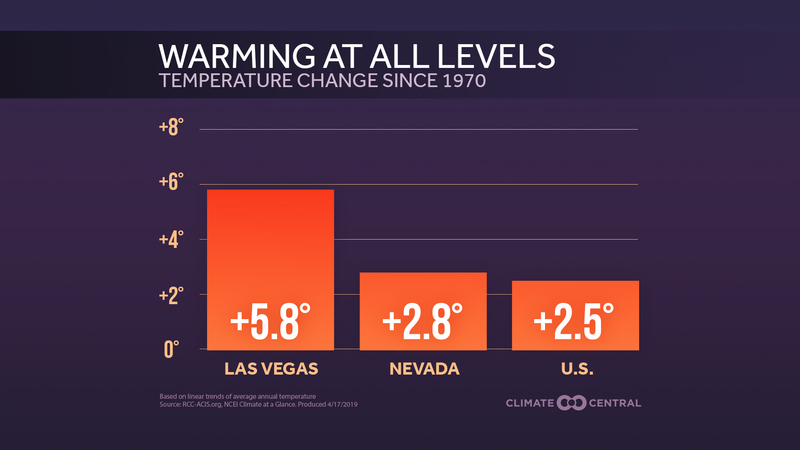 According to an analysis by Climate Central, average annual temperatures have been increasing faster in the Southwest than in any other part of the country. 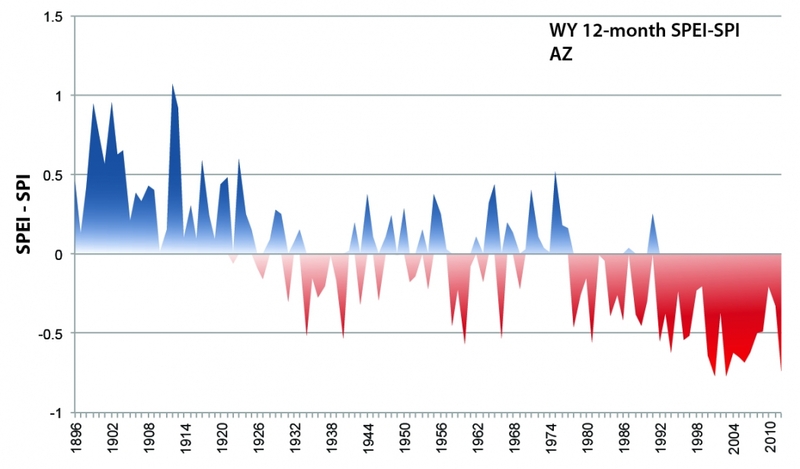 Since 1970, temperatures in Arizona have been climbing at a rate of 0.639 °F per decade. As a result, rates of evapotranspiration have been increasing as well. A screenshot from Climate Central's interactive report on temperature trends, The Heat is On. Drought in the West is still ongoing, and forecasters don’t see a clear end in sight. However, the upcoming monsoon season may bring some relief to parts of the Southwest, especially in Arizona. U.S. Seasonal Drought Outlook, June 20, 2013. NOAA’s measurements show that high-pressure system is already in place over the Southwest. 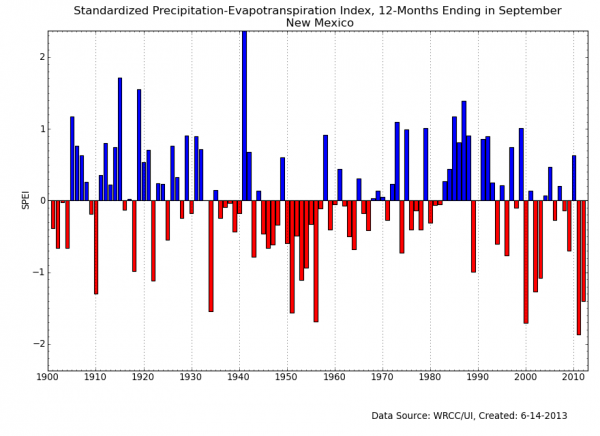 But how wet the 2013 summer monsoon season will be is notoriously hard to predict. John J. Brost, a forecaster with the National Weather Service in Tucson, has been looking at all the factors that go into predicting the strength of the monsoon season, but none are showing a clear signal. Three of the major climate models are forecasting an average amount of precipitation. The current combination of ocean currents – including a neutral El Niño – is a combination that has corresponded with a dry season in the Southwest before, but not always. 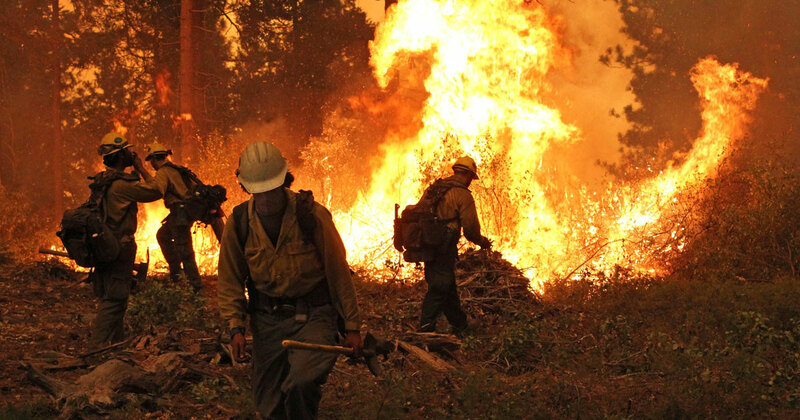 Ongoing Coverage of the Historic Drought in the U.S.